Every shape, size, and color. Much of our stock is constantly changing with every order that we do. But, we have several lines of dog toys that we keep in stock year round! KONG founder, Joe Markham, loved his trained police dog, Fritz, but did not love his destructive chewing habits. Where other dogs might have chewed your shoes or favorite purse, Fritz loved to crunch on rocks, sticks and other harmful items. Fritz’s teeth were wearing down and his need for stimulation and play was not being met, and Joe was frustrated. One day, while working on a VW Bus, Joe began throwing out car parts to Fritz to lure him away from those rocks. Fritz was immediately taken with a rubber suspension part and dropped it in Joe’s lap to play. The erratic bounce and toughness of the rubber inspired Joe. 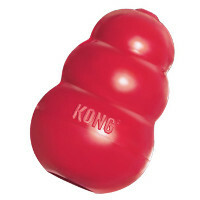 They’ve been making KONGs from their own proprietary, pet-safe, built-to-chew rubber ever since. Dogs love KONG. The way it bounces keeps them engaged and ready to play. It has a soft mouth feel for a satisfying chew and, of course, it’s super durable. Owners love KONG too; they can stuff it, throw it, leave it out in the yard – KONG keeps coming back for more. Here at Cowtown we carry the entire KONG line of toys, but here’s a quick look at a few of the many different types of KONG available. The KONG AirDog Bone combines two classic dog toys – the tennis ball and the squeaker toy – to create an instantly recognizable bone shape that’s the perfect fetch toy. Our durable, high-quality AirDog Bone will not wear down a dog’s teeth. It’s made with a special nonabrasive felt, compared to the abrasive material on normal tennis balls. 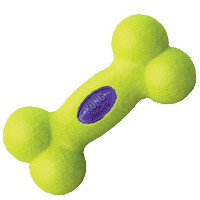 Perfect for games of fetch – Squeaker to induce play – Nonabrasive tennis material will not wear down your dog’s teeth. 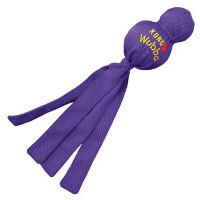 The KONG Classic has been the gold standard of dog toys for over thirty years. 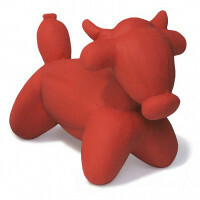 Our super-bouncy, red natural rubber compound is perfect for dogs that like to chew. Perfect for stuffing with KONG Stuff’N treats. The KONG Genius Leo is named in honor of genius Leonardo Da Vinci and is designed to stimulate a dog’s curiosity and hold its attention. The toy is great for helping combat boredom and separation anxiety and can be used as a treat dispensing toy on its own – or connected to the Genius Mike for an increased challenge. Genius toys are great for puppies and adult dogs alike. 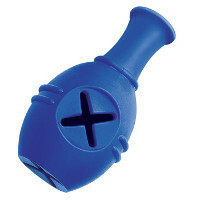 Perfect for use with our Stuff’N IQ Treats. Reduces boredom and separation anxiety for average chewers. Interlocks with other Genius toys for an added challenge. Charming’s fun and whimsical Balloon Collection has just popped up! These bright, all natural latex toys will show canines that balloons aren’t just for parties anymore! Six types available: Baxter the Bull, Digby the Duck, Dudley the Dog, Hazel the Horse, Pearl the Pig and Shelly the Sheep. Available in sizes: Small, Large or Mini. Charming’s fun and whimsical Jungle Balloon Collection has just popped up! 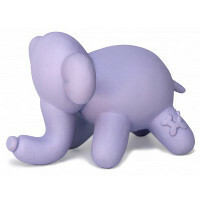 Six types available: Emma the Elephant, Garry the Gator, Lily the Lion and Murray the Monkey. Our colorful Barnyard family is moving up! Our outrageous Chickens have all been restyled into sleeker styles, but still featuring all-natural premium latex with 86% rubber! All-natural latex paint makes these smooth characters the perfect companions to tickle you and your canine pals. Each character has a unique biography included with each toy. Guaranteed to bring a laugh to pet owners as well as hours of fun to their favorite canine companion. Available in sizes: Large or Small. Chuckit makes it possible to “Outplay the Ordinary” by creating the most fun, functional, innovative, and high-quality interactive play toys that promote activities for canine fitness and enhance the human-canine bond. We carry the full line of Chuckit launchers and accessories, so here is a quick look at Chuckit dog toys. Bionic Rubber is a revolutionary material that can withstand the aggressive play patterns of most pets. Bionic products have been tested in rescue shelters and day cares around the U.S. for years. By making and destroying countless samples, we know Bionic Rubber can hold up to the most aggressive chewers. We make ’em for dogs to shake ’em! These are some real in-your-face dog toys! There’s a reason for that and it’s because they help dogs satisfy deep-rooted instincts. The behavior to carry prey in the mouth is instinctive and the flaps help simulate that same mouth feel. Flappy also encourages sporting behavior such as fetch and retrieval and is also great for lively in-home play! Flappy Dog Toys feature vibrant, contrasting colors, unique fabrics for different activities (like crinkly flaps for cuddling or cotton rope for chewing), and feature a size for every breed! Designed to encourage positive play – Teach your puppy healthy chewing habits from the start – Keep them happy, busy & entertained – Available in many textures & materials to satisfy the needs of your teething puppy. Tuffy Pet Toys are the most durable toys available. All the layers of this toy are bonded and sewn together to make one “Tuff” Layer. Sewn Multiple Times: Most toys have just one seam to hold the toy together. Tuffy toys have webbing around the edges of the toy and then the edges are sewn together to make each toy Tuff. Multiple Layers Sewn Multiple Times! Squeaker Safety Pockets: Each toy is stuffed with safe, non-toxic fiber and we added a protective pouch around each squeaker as an added safety measure in the unlikely event your dog gets to the core. Our toys have been tested on numerous dogs (including our own) to ensure the highest quality and most fun for our best (four legged) friends and the best value for our two legged customers. Individual toys have a durability rating, with 10 being the most durable. Several design lines available: Aliens, barnyard animals, desert creatures, dinosaurs and dragons, the mega shape series, the ultimate chew ring series, sea creatures and zoo animals.